Klotho, a gene in both mice and men, has a definite effect on aging, according to Dr. Makoto Kuro-o. Stimulating the Klotho gene seems to delay many of the effects of old age, like weakening of bones, clogging of the arteries and loss of muscle fitness. For their current study, Kuro-o and colleagues created a strain of mice in which the Klotho gene is more active than in normal mice. The mice lived between 19% and 31% longer than normal mice. To understand the mechanism by which Klotho suppresses aging, my laboratory is focused on determining specific activity of Klotho protein and identifying molecules that interact with Klotho. 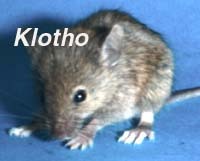 The klotho mouse is the first laboratory animal model of human aging caused by a single gene mutation. Studies on the klotho mouse and the klotho gene are thus expected to provide new insights into human aging. An interesting note is that it appears that the Klotho-enhanced mice who are more long-lived seem to have fewer offspring as a side effect. Also, the effect of Klotho on insulin could create a problem because it may extend life at the expense of making people diabetic. Mice with the Klotho gene are not the first to help human beings achieve longer life; read about Yoda, the world's oldest mouse and the Methuselah Mouse 'M' Prize. Science fiction authors have been interested in technologies that might lengthen human life; almost invariably, each of these methods also has a particular flaw. Kurt Vonnegut wrote about anti-gerasone in his well-known short story Tomorrow and Tomorrow and Tomorrow. Anti-gerasone's flaw was that it worked too well - neither material goods nore inheritance laws could keep up. In A World Out Of Time, Larry Niven writes about a drug called young-forever, which puts off death almost forever. Unfortunately, it works only with children, who then never go through puberty. The desire to live forever, and the belief that it will never quite work out, of course predates science fiction authors. The ancient Greeks wrote about the goddess Eos, who fell in live with a mortal man, Tithonus; she asked Zeus to grant him immortality. Zeus did so, but Eos forgot to ask for eternal youth; Tithonus lived on and on, eventually withering into a shrill grasshopper. And, as it happens, the name "Klotho" is also derived from the Greek myths. Klotho combed and spun the thread of one's life, Atropos wove the thread into the fabric of one's actions, and Lachesis snipped the thread at death. Find out more about Dr. Makoto Kuro-O and Anti-aging protein extends mouse lifespan.